We are at week 2 of this edition of the One Room Challenge! 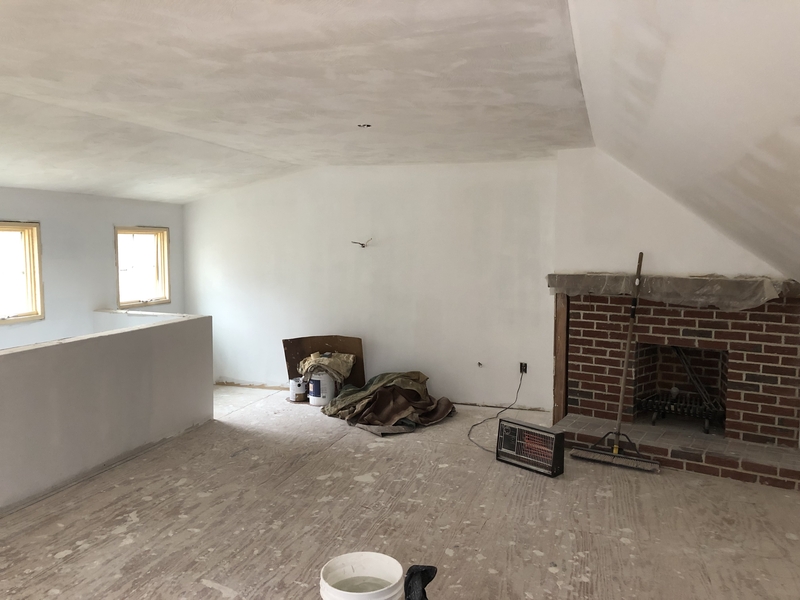 It is late, late Friday night I am posting this rather than bright and early Thursday morning because…….I wanted to show you the progress that I (mostly) knew we should have by the end of this full week of work! 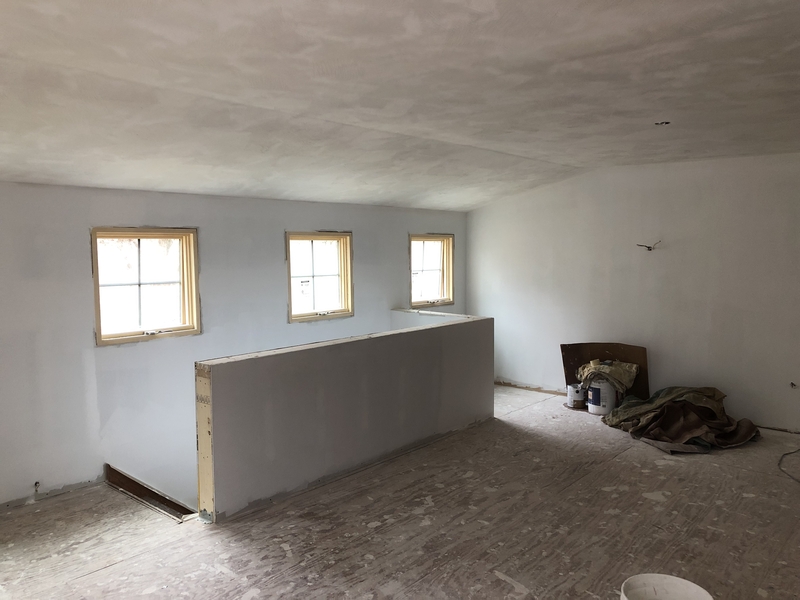 We have been dry-wall mudding and taping to get the walls prepped for paint, and since the drywall was so old, we NEEDED to prime first and get the base sealed and ready. We have been experiencing a lot of bleed through of a pretty rusty brown that we needed to seal so we can have our beautiful white color up here. Before I dive into the plans and inspiration for the space, as well as the previously mentioned progress photos….let me welcome you if you are new to my blog, and tell you a little bit about the One Room Challenge. It was started over 7 years ago by Linda Weinstein of Calling It Home as a challenge to complete a room from start to finish in 6 short weeks! Every Spring and Fall, 20 Featured Designers, and over 200 Guest Designers and DIY design enthusiasts take up the challenge and create the biggest, most supportive and energized group of people! These folks create the largest “Before and After” party on the internet. I have benefited from all the support and inspiration and worked on 6 terrific spaces, all while meeting and talking to loads of talented people over the years…I am so, so grateful……JOIN US!! Last week I introduced the space I am working on and gave a brief overview of the general inspiration for the window re-vamp, as well as the overall feel I am going for for the room. “The Room Over the Garage” as we have called it forever…..a MUCH less interesting space than the famous “Room with a View” from that great movie, haha. Well, now it has a name, drum roll please…. I live in a beautiful rural location in Hollis, New Hampshire so anything that I do is in the “Country”, but I am not thinking of the cutesy, folksy decor called country…just the location! There will be a bit of a woodsy, more natural and rustic feeling here, as well. “Loft” because this room now looks out into the trees on our property and a loft is an open space that has a lot of possibilities…I don’t have a sophisticated city loft, but this is going to be a bit of that vibe, for sure. “Retreat” because this space is away from the rest of the house and I want it to feel like you have gone “away” to a space where you can breathe and relax – I hope to create a place that helps you unwind and recharge for our busy lives. 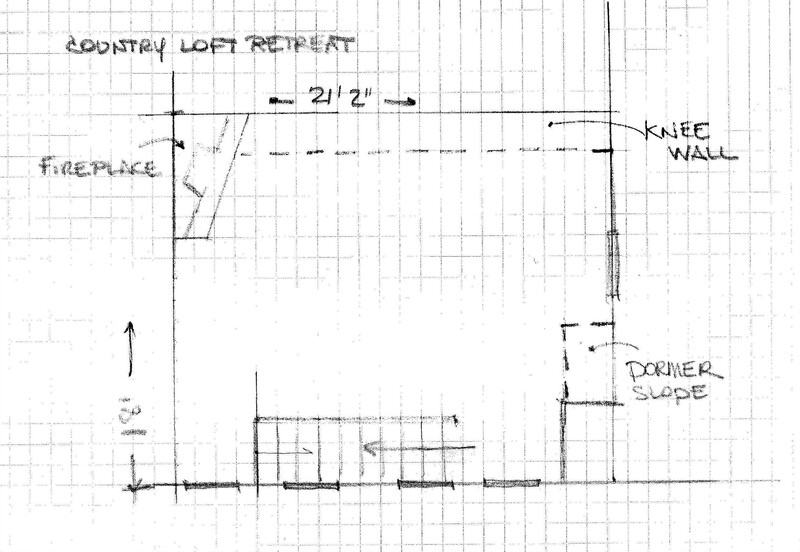 Here is the floor plan – 21 ft x 18 ft with a working fireplace, some sloping dormer challenges, but a wide open space to work with! Forgive the pun, but I do have lofty goals for this room! I am taking inspiration from some of my favorite designers to create a restful, neutral space filled with natural materials and fabrics. Casual and sophisticated, as well as light and airy. I love rattan, neutral and bold patterns, and I have some quirky, personal pieces that I have not been able to use in other rooms in the house. 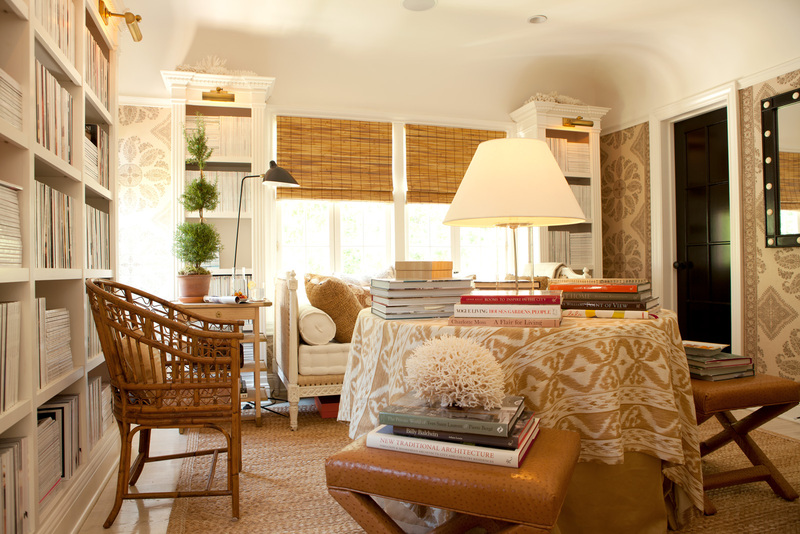 There is a bit of a casual California vibe to Mark Sikes work and I LOVED his Book Room from his Hollywood Hills house. I love everything about this room and will be striving to create this feel for our Loft retreat. Another designer whose work I admire is Lauren Leiss. Known for her casual and natural approach – I love her mix of vintage, organic, and relaxed sophistication…perfect for this Loft in the Country! 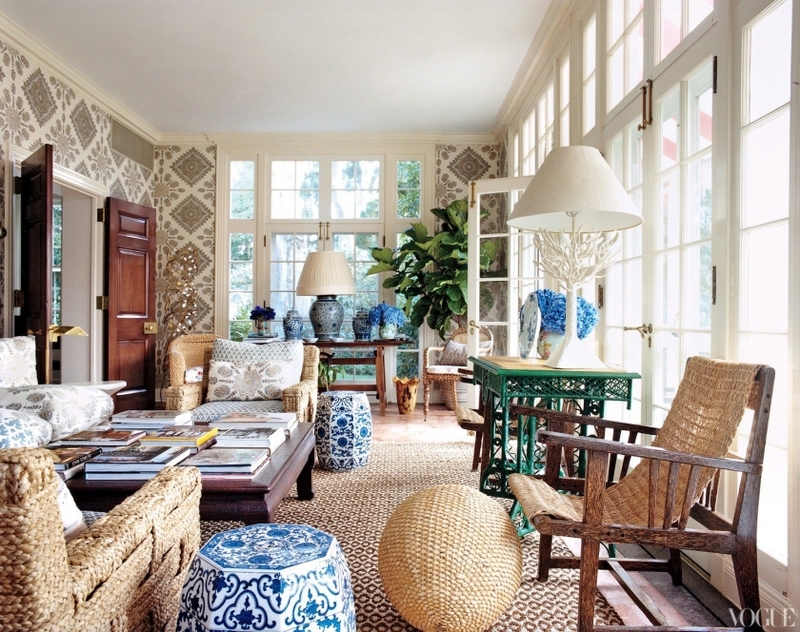 Tory Burch’s sunroom, designed by Danial Romualdez, is another favorite with its sophisticated layers. 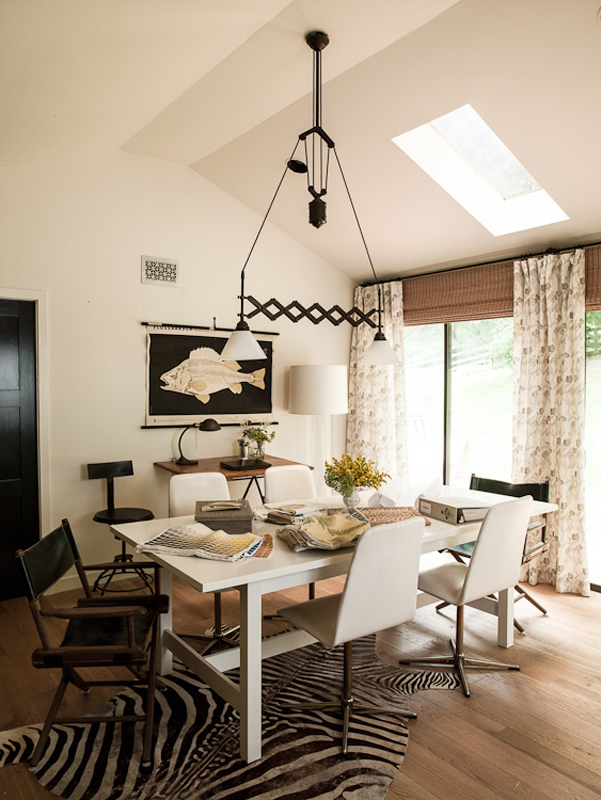 This room has been very popular as a look to strive for – the details are really special, with a mix of antiques, natural textures and a cozy casual vibe. There is even a space for some blue and white! 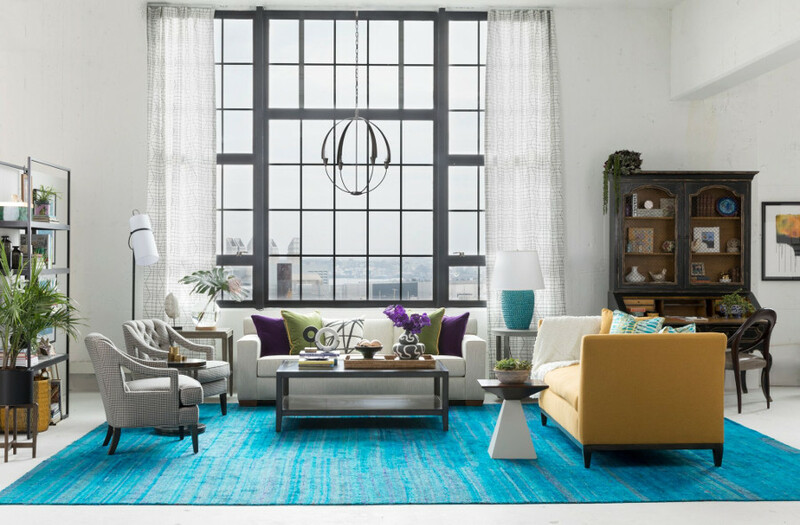 Speaking of color, I took a lot of inspiration as far as the mix of furniture and sophisticated loft vibe from Linda Holt’s fantastic One Room Challenge room last Spring. Linda started with a similar “blank slate” and created the casual sophistication I am looking for. Her work always has great colors and I hope to bring in a bit of this cheerful brightness as well. Now that we have our walls and ceiling prepped, our blank slate is ready for us to start adding the layers! This week we should be able to trim out the windows and the other mouldings, as well as start thinking about the final version of the fireplace design. I posted some photos on Instagram of possible fireplace surround direction, and I need to make some decisions. You can see all the photos of this room on my ORC highlights from IG Stories, and I will keep posting as we go through the next weeks. I have some ideas of possible beam details for the ceiling to start to build those all important bones of a room. I plan on finalizing the selections for the flooring materials, that should be part of week 4’s plan. Be sure and check in with all the Featured Designers and all the other Guest Designers, there are some really interesting rooms and design ideas to inspire you! I hope that you follow along as I create my Country Loft Retreat! !